NASA and the Johns Hopkins University Applied Physics Laboratory have published new images of the Kuiper belt Object cataloged as 2014 MU69 and nicknamed Ultima Thule along with animations that show new details of its shape. A sequence of 14 images captured by the New Horizons space probe during its January 1, 2019 flyby shows that the this object’s two lobes are not vaguely spherical as it seemed but in particular the larger one is definitely flat, to the point that it was compared to a pancake, and it’s not clear why it has that shape. Ultima Thule’s shape is one of the characteristics that attracted the greatest interest of researchers since the observations made from the Earth showed that it was elongated and therefore there was the possibility that it might actually be not a single object. The images sent by the New Horizons space probe made it clear that it’s made up of two lobes, two smaller asteroids that clashed at a relative velocity low enough to make them merge, which aroused the public’s imagination with a series of funny comparisons. On a more astronomical level, the most fitting comparison seemed to be the one with the two-lobe nucleus of the comet 67P/Churyumov-Gerasimenko, object of study of another extraordinary space mission since the Rosetta space probe was in orbit around it until its conclusion, occurred with its impact on the comet’s surface on September 30, 2016. The comet’s activity when approaching the Sun caused the sublimation of many normally icy materials so its shape became irregular but originally its two lobes must have been vaguely spherical. Ultima Thule might contain many frozen materials as well, and ascertaining it is one of the goals: if this were the case and it approached the Sun it could become an active comet therefore the comparison with 67P/Churyumov-Gerasimenko seemed really appropriate. The latest images, however, show a very different situation revealing the profile of a part of Ultima Thule not illuminated by the Sun in the minutes following the New Horizons space probe’s flyby. The central photo was taken at 5.42 UTC on January 1, 2019 at about 8.862 kilometers (5,494 miles) beyond the asteroid. The image right below (NASA/Johns Hopkins Applied Physics Laboratory/Southwest Research Institute/National Optical Astronomy Observatory) shows two of those photos. Because of the position from which the photos were taken, very little of Ultima Thule could actually be seen but the New Horizons mission’s scientists took advantage of the fact that it was seen from different angles to reconstruct its shape by examining which stars in the background were covered and which ones remained visible thanks to the long exposure time used in capturing those images. There’s some degree of approximation in this process but the results clearly show that the two lobes of this object are flattened. In particular, the larger lobe, nicknamed Ultima, was compared to a pancake for the flatness shown while the smaller one, nicknamed Thule, is more ovoid and was compared to a dented walnut. The top image (NASA/Johns Hopkins University Applied Physics Laboratory/Southwest Research Institute) shows the comparison between the idea we had made of Ultima Thule after seeing the first photos and the reviewed one after analyzing the latest images. The dashed blue line shows the area of ​​uncertainty due to the fact that the shape was deduced and not directly seen. 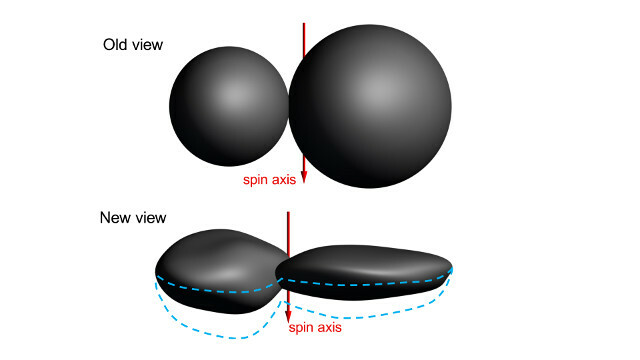 In any case, Ultima Thule offers a new mystery because we don’t know what kind of process can lead to such a flattened shape for an asteroid. Despite its small size and therefore limited gravity, the tendency is towards a spheroidal shape and a collision violent enough to radically alter an asteroid’s shape is supposed to destroy it. The New Horizons mission’s scientists are waiting for the next images and other data that the space probe will keep on transmitting slowly until 2020, hoping to understand the reason for Ultima Thule’s strange shape. Since one of the mission goals is to better understand the formation mechanisms of planetesimals that also formed the solar system’s planets, solving this new mystery could improve our current planetary formation models. This short video shows the sequence of images used to reconstruct Ultima Thule’s shape. This short video shows an animation with the reconstruction of Ultima Thule’s shape deduced from the last images received.